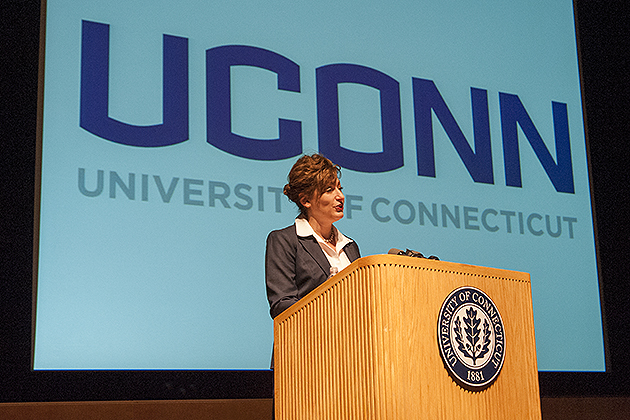 During her second annual State of the University address, held this afternoon on the Storrs campus, UConn President Susan Herbst announced the University’s newly adopted visual identity program and introduced a new custom wordmark for the institution. UConn’s new visual identity program will serve to unify and promote the University’s distinct institutional brand at a time when consistently presenting an image of excellence across the University has become vital, Herbst said. “We need to broadcast who we are or we will waste away, as other very sophisticated and successful universities dominate public discourse and the search for knowledge,” Herbst said during her address. The new primary wordmark – presented as “UCONN,” in all capital letters – lies at the center of the University’s visual identity and has been designed to create a powerful symbol that is representative of the University as a whole. Recent University research indicates that the University of Connecticut is widely known today as UConn; a number of other institutions have similarly embraced shortened school names as their primary naming convention for their academic and athletics programs, including MIT, UCLA, Georgia Tech, Pitt, and Penn. The newly adopted wordmark has been created for institutional and academic use across the University. It is a modified version of the wordmark developed in recent years for the UConn Athletics program, which began working with Nike last year to unify the numerous disparate logos used by various UConn athletics teams.